Lunana snowman trekking goes up to the remote Lunana district in northern Bhutan and is considered as the toughest trek in the country of distances, altitudes and its solitude. Bhutan for a long time the "Forbidden Kingdom", still limits the number of tourists visiting the country, to protect the cultural heritage and preservation of natural wealth and beauty is still the number one priority of the country. The snowman trek is considered to be the most challenging trek and of the longest duration in Bhutan. This trek provides an in depth look of the unspoiled and old traditional lifestyle of the Bhutanese; not only the grandiose mountain views and alleys of the Himalya region but also the lifestyle of the mountain people living in harmony with nature and gods. For the snowman trek one must be in top physical condition to be able to make Lunana snowman trekking. Flexibility and patiente is required at times especially when one confronts logistic problems arising with yaks and horses. While on trek one is expected not to distributed sweets, pen/pencil etc to children and villagers also. Drive to the end of the motor road at Drukgyel Dzong to begin the trek. Todays trail follows the river uphill through a narrow agricultural valley as far as the border army camp at about 2890 meters. (15 kilometers, 5 hours walk). 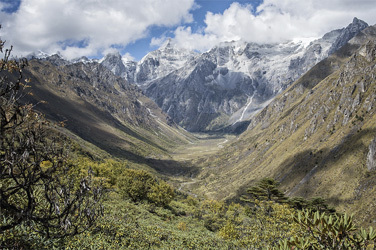 It's possible to walk to Tsophu and fish or hike in various directions: towards Mountain Jomolhari and its subsidiary to the west, Jichu Drake to the north and unclaimed summits and ridges to the east. The trail climbs gradually to Nyili La Pass (4680 meters). Broad yak pastures can be seen along the length of the route. 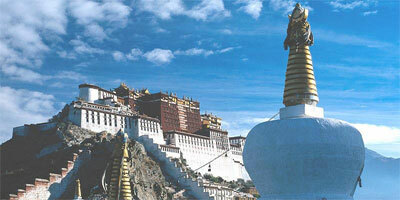 If the weather is clear, there is an excellent view of Lingshi Dzong as we descend into the Lingshi basin. Tserim Kang and its descending glaciers can be seen at the north end of the valley. The Lingshi area has 118 households and about 300-400 people, some of whom live a great distance from Lingshi. There also used to be some Tibetan refugees. (5 to 6 hours walk, distance 21 kilometers, camp at an altitude 4010 meters). Beware of the dogs while crossing the village. After the village a stiff, steep climb of about 450 meters up a grassy slope leads to a peak called Inela. During the climb you might see herds of blue sheep, bearded vulture. Later, the hike descends through a forest on a wet trail and we will approach by the river. (Altitude 4000 meters, 14 kilometers, 5 hours walk). The day starts with a climb of about 200 meters, after which the trail levels and changes from a southerly to an easterly direction. The area is full of Yak herder huts. You will come across a swampy area where there is a big river, where the bridge will be hopefully found in place. The herders have to rebuild the bridge almost every year, so be prepared to cross the river, which can be cold and powerful depending on the time of the year. A steep 40 minutes climb will lead to a nice campsite. (Altitude:4160 meters, 16 kilometers, 7 hours walk). Start early so as to enjoy the best possible view from the pass. The trail crosses some small streams and you will come across a platform with lots of prayer flags. From here a large glacial valley opens up leading to the east and finally to today?s pass. When we follow the trail you will hear shrill noises which are of marmots, whose holes can be seen everywhere, the hill sides here are covered with medicinal plants. The campsite is through a beautiful cedar forest, with Great Tiger Mountain looming over camp. (Altitude: 4160 meters above sea level, 16 kilometers, 7 hours walk). You will follow the valley down parallel to the Timuchang Chhu through a cedar and then fir forest. Yak people from Laya might overtake with their yaks carrying loads of smuggled goods. About 30 minutes before reaching Laya, there is a clear split in the trail. The left fork is better, after some small ups and downs and crossing a ridge you reach a chorten and a prosperous Laya village appears before you. 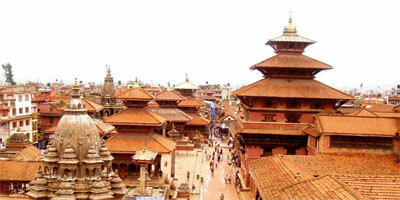 (Altitude: 3800 meters above sea level, 9 kilometers, 4 hours walk). It's a rest day whereby you can check your supplies and final arrangements will be made between the guide and a yak/horse contractor. Laya village is worth a visit. 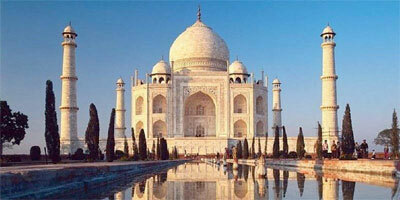 There are numerous temples and lakes which you can visit. Laya people regard and highly respect lakes as their deities' therefore it strictly prohibited to swim or throw stones into the lakes. You will also come across people playing archery with traditional bows. Laya women unlike other women in the country have a very unique way of dressing themselves. Since you have reigned your strength, enjoyed village dwellings and a dancing show by Laya ladies, today?s trail follows through fields and clusters of houses. Later you will climb steeply through the forest on a muddy trail whereby Bhutanese/Austrian project are underway to control the glacial lakes. Leave the Mo Chhu behind and move into a narrow valley to the East. The trail continues through the forest finally coming to the campsite after crossing a small bridge. From the camp so many snow capped peaks can be seen. (Altitude: 4215 meters above sea level, 14.5 kilometers, 7 hours walk). Today you will cross the Rodophu Chhu climbing steeply upward for about 45 minutes. You will then come across open valley where vegetation is mainly alpine herbs, grasses, moss and lichen. The trail continues for 3 to 4 hours between 4900 meters and 5000 meters along a big, generally flat, barren plateau with a few ups and downs. You will camp next to spectacular Gangla Karchung Mountain and at this altitude one feels almost like an alpine bivouac. (Altitude: 4940 meters, distance: 16 kilometers, 7 hours walk). Today's trail is a climb towards Karkachu La. Staff will be carrying warm pack lunches for you. After crossing the pass you will be into Lunana area. This pass gets closes in winter for months due to snow and even in monsoon. You will then be rewarded with a spectacular view of three lakes and mountains. You will also come across long and sometimes steep descent and you will reach a stream known as Kephu. From here, a leisurely 2 hours walk follows the flat bottom of the valley to the campsite in Tarina. (Altitude: 3938 meters, distance: 16 kilometers, 7 hours walk). Today you will walk for around 1 hour parallel to the Tarina Chhu, surrounded by some beautiful water falls. Later the trail becomes muddy through the forest and after 30 minutes starts climbing steeply, crossing landslide areas. You might reach Woche village bit early and perhaps early for lunch also. Therefore we will move ahead to a good campsite which is around 1 hour 30 minutes. (Altitude: 4163 meters, distance: 14 kilometers, 6 hours walk). Todays path is wide and sandy, with many small flowers and herbs, and a good view of Woche Chhu. Across the places there are several glacial lakes which brought disaster causing several damage downstream in 1090.With this glacial outburst Punakha Dzong (Fortress) was also partly destroyed. Later a 20 to 30 minutes short, steep climb leads to Lhedi. It is a small village with schools, BHU(Basic Health Unit) and radio wireless stations. (Altitude: 3900 meters, distance: 13 kilometers, 5 hours walk). Today's path follows through the last forest encountered for the next couple of days (fir and juniper). After a short walk a deep shaped valley in the north. There are numerous settlements that can be seen in the left, opposite and below. The path continues following the left bank of the Pho Chhu, crossing excellent view of Table Mountain. After some time you will come across a campsite in Thanza. These regions are abandoned during the harsh winter months. (Altitude: 4100 meters, distance: 17 kilometers, 6 hours walk). Today's path follows a climb towards sparsely vegetated hill to the east, to a large square- looking boulder on a hill south of the village. There are some excellent views of mountains and Lunana. Later the path turns to south which is generally gentle and easy. The campsite is at 4960 meters besides one of the larger blue green lakes. (Altitude: 4540 meters, distance: 16 kilometers, 7 hours walk). Today's path follows a climb and you will climb the first of three passes at about 5100 meters. You will come across panoramic views of snow capes peaks. Watch out for snow partridges. You will now go through several trails leading to a next big lake whereby you will also see a carpet of blue and violet alpine flowers in full bloom. After the third pass you will come to the campsite and the vegetation around includes all kinds of herbal plants. (Altitude: 5060 meters, distance: 19.5 kilometers, 6 hours walk). After crossing some moraines and a small stream, today?s path will be visible. Its a challenging climb to the highest pass of the trek (5326 meters). This starts with a gentle climb along two lakes. You will come across excellent views and mountains. Later a long descent starts into the broad, sometimes marshy valley. The trail will now flatten and there are several camps on the way finally reaching to the campsite. (Altitude: 4450 meters, distance: 19.5 kilometers, 8 hours walk). Today there are many stones to cross by hoping from stone to stone. The trail is very muddy and slippery at first, and later it is covered with boulders. Later there will be a steep climb through a forest of juniper and fir leaves the valley floor behind. A steep climb and a short walk parallel to the valley will lead you to a beautiful lake and next to the lake is your campsite. (Altitude: 4355 meters, distance: 9.5 15 kilometers, 6 hours walk). Today is the last day of the trek. You will now bid farewell to the yak herders. The trail is easy. Several tributaries have to be crossed on various kinds of bridges, as well as a couple of clearings with some huts. Finally after a long time, the forest/jungle opens up with a view towards agricultural valley. Later you will come across motor road where your driver and car will be waiting to take you to your hotel where you will be staying tonight. (Altitude: 2627 meters, distance: 23.5 kilometers, 5 hours walk). Drive to Trongsa Altitude: 2200 meters above sea level.Trongsa forms the central hub of the kingdom and is historically the place from where attempts at unifying the country where launched. 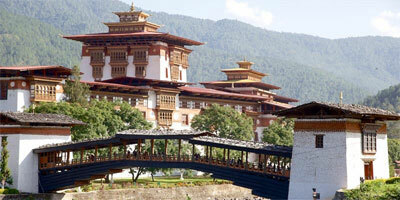 The following are some of the prominent places to visit in Trongsa. Overnight Trongsa Hotel.